The brief shower of rain beforehand was not threatening, but nevertheless sufficient for umbrellas to spring up most suddenly, like multi-coloured organic mushrooms, and for cagoules to be extracted and hastily donned. This was the scene before Joan Baez’s concert and the scenario was briefly repeated afterwards. The weather in northern Europe is nothing if not fickle, even in summer, and putting some 2,000 odd seats outdoors, with no overhead cover as there used to be, under the sadly departed metal “tent” which once artistically and practically sheltered concert goers along the Museum Mile, seemed brave. Thanks to the organisers though, there was a small benign army of ardent seat wipers around who did a splendid job of allowing as yet unseated dry bottoms to remain dry whilst enjoying Joan Baez. Ever more in a modern society, increased profit expectations tend to count more than mere meditation and deep thought. No one near me, however, complained about the weather. 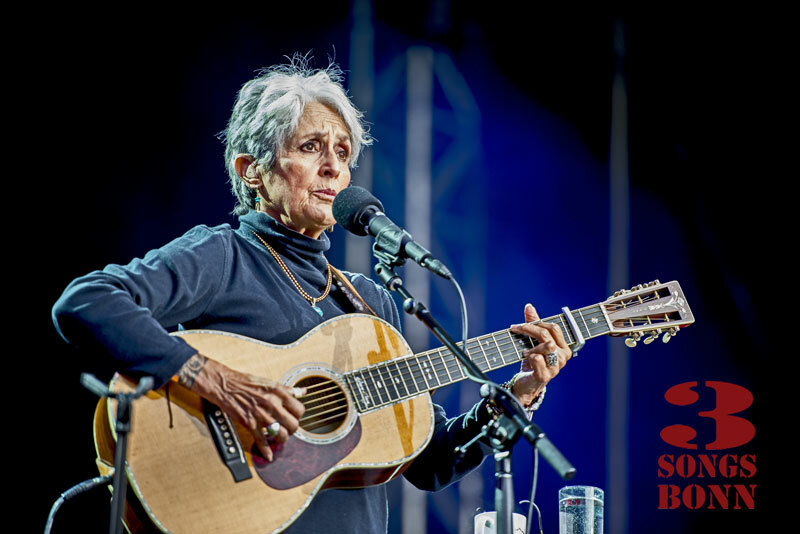 It seemed as if Joan Baez’s mere physical presence allowed a rare intrinsic soulful harmony to pervade this Rhineside field. If this were so, it did not surprise me in the least. Indeed, it was good so. Was it luck perhaps? It was certainly a crowd full of expectations. More likely the key was the sheer strength of conviction of this uncompromisingly resolute lady who recently received the Ambassador of Conscience Award from Amnesty International for her continuing integrity and philosophy of justice in a musical career spanning well over half a century. Joan Baez just happened to have co-founded the USA branch of Amnesty International, so both of these worthy institutions go back together a very long way. Joan Baez has counted Dr. Martin Luther King and Vaclav Havel as friends, and both Apple’s Steve Jobs and Bob Dylan as lovers. She is a purist who would probably have entered into dialogue with the talking snake in the Garden of Eden, if only to check out its anti-war credentials and its commitment to non violence, without necessarily actually biting into the apple, and thus perhaps either pleasing and/or displeasing God with the original sin….. such an enigma she personally is, despite her external clarity in the definition of her own personal ideas and ideals for improving humanity for everyone’s sake – or snake. Needless to say, it could well have rained, but it didn’t. My guess is that it didn’t dare. A woman in her best years, shortly after half past seven, strides proudly and upright and alone upon the stage, with a certain well earned pride in her step. For a brief moment she lets her guard drop and has a little septogenarian moment, as she gigglingly reveals that she has, in all the excitement, forgotten to remove her spectacles before coming on stage. This was, however, the first and last moment of the evening where the lady was not one hundred percent focussed upon the historical musical journey along some of the most significant milestones occuring in the second half of the twentieth century, that she was just about to take us on. Indeed, Baez herself has played a pivotal and integral personal role in shaping this particular musical genre. 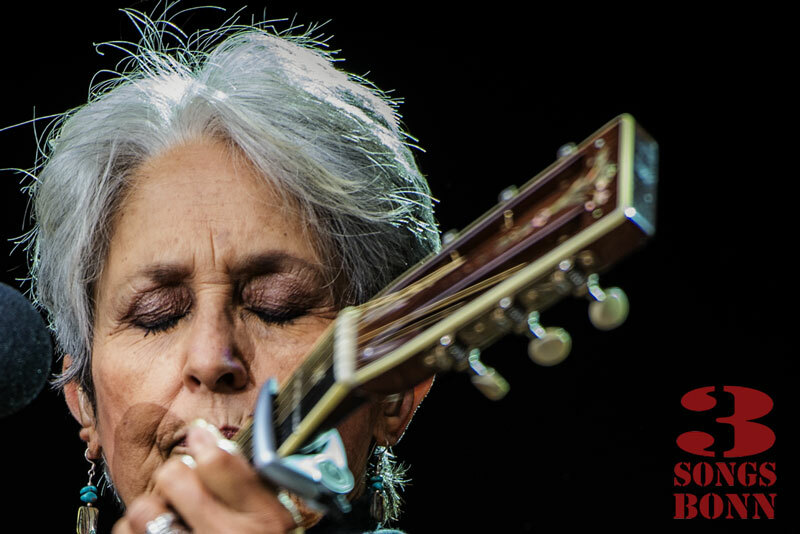 Joan Baez is a very courageous human being of the type one doesn’t often see, anywhere, anymore. The kind of courage that many aspire to but which very few people actually achieve. She has a consistent message of pacifism and non-violence and she conveys this message with a fine soprano voice that rings like a clarion bell. She is also a fine guitar picker and fond of fine guitars, Martin guitars especially. She alternates an old vintage 1929 0-45 model purchased in 1959 with a Joan Baez 1998 0-45 JB signature model, the first of a run of only 59 in a series of guitars which Martin made especially for Joan. Baez is the sort of legend that attracts anecdotes and the making of the Joan Baez signature model 0-45 guitar is no exception. The Martin guitar company, with fine attention to detail and wishing to make as close a replica as possible of Joan’s original 1929 model, asked her to send it to them in 1996 so they could dismantle it and measure it before re-assembling and refurbishing. It seems however that when she took her guitar to a luthier for some body repairs in the 1970s he repaired the woodwork of the guitar, but before replacing the wooden soundboard, played a little prank. He probably liked her music and couldn’t possibly not have appreciated her guitar picking, but he was also perhaps a bit of a redneck. As a (silent) protest against her politics, he wrote on the inside of her soundboard (where no one would normally see it again or ever be able to read it) the words: “Too bad you are a communist”. Both Joan and Martin ultimately decided to go with the flow of this delicious irony and incorporated this comment under the soundboard of the new signature model edition guitars in 1997, even providing the proud new owners with a small inspection mirror in order to be able to read it inside the guitar. So, wielding a Martin 0-45 as in the old days, with a hidden secret messageto inspire her, Joan kicks off on her own with an old and very tragic folk song, Railroad Boy. Some of us are still somewhat anxiously wondering how the evening will unfold. Deep in our hearts we knew it, but the first few vocal notes confirmed and verified it, she still has that sparkling crystal clarity to her soprano voice which first set her apart from so many other singers and wannabee singers, all those years ago. Railroad Boy is not a song for the faint hearted, like its related heritage song, the Butcher’s Boy, it describes a most tragic story of unrequited love. The jilted young lover, whose saddened mood has raised deep concern in her parents, is found hanging by her father, who cuts her down and finds a message attached to her bosom, asking to be “buried with a white snow turtle dove on her chest, to tell the world that she died of love.” A lot of people might think twice, before opening their set with such a song, but actually it worked perfectly well for Joan, the ultimate female protester who would very likely have been prepared to “die of love”, had she been called upon to do so. Joan is a woman who doesn’t have anything left to prove, but still has an awful lot left to give. Still alone on stage with the Martin guitar, I belive in prophecy is the opening line of God is God a song Steve Earle wrote for her and is also on her 2008 album. It’s a wonderful song that fits her like a glove. Never seen a line in the sand or a diamond in the dust, it continues, I believe in God, and God ain’t us. Joan regularly reminds us, outside of this song, that one of the greatest problems facing the modern world is that way too many countries, sometimes even somewhat over passionately believe that “God is on their side”, and that is not necessarily good for someone with passionate pacifist and non-violent beliefs, quietly trying, often against all contemporary odds, to make the world a better place for fellow human beings, whatever their nationality or creed is, to live and trust in. Joan is now joined on stage by Dirk Powell on the 5 string banjo. Powell is a man whom she correctly describes as someone blessed by God, with more than his fair share of talent and then some. 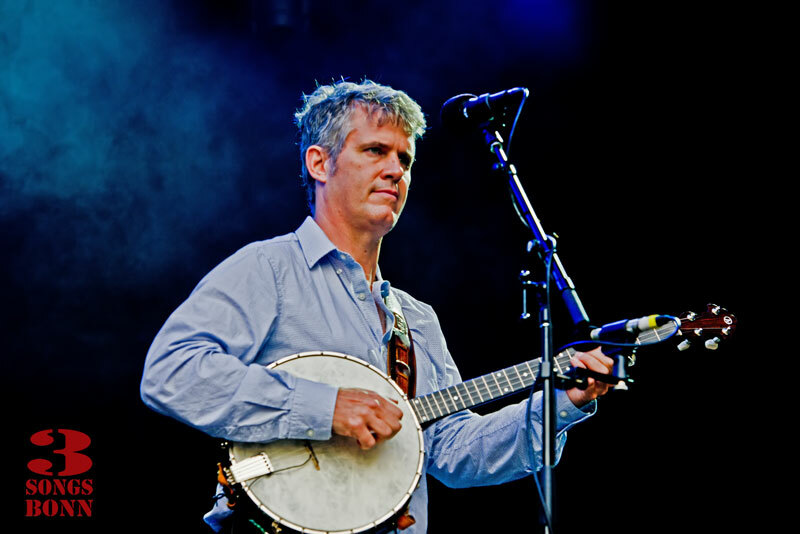 He is not that well known on the European side of the pond but anyone familiar with the marvellous BBC series “The Transatlantic Sessions”, knows his ability on the banjo. 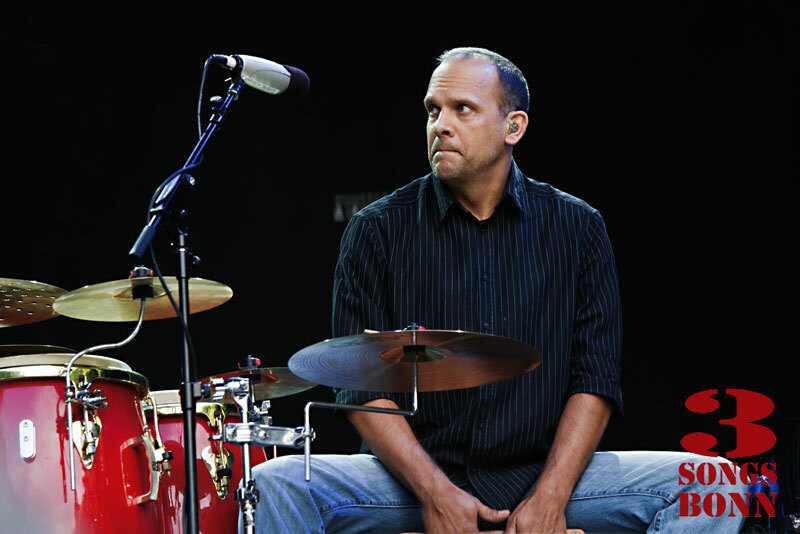 On percussion is Joan’s son “Gabe” (handsome) Gabriel, from her commitment to a five year marriage to fellow pacifist and anti-draft activist Dave Harris. It’s a song she jokingly says she seems to have been singing for close to a century, and indeed it was on her debut album, (so it is actually only over half a century) but a song she still gets many requests for, called Silver Dagger. A lyric also of unrequited love, but this time, of the enforced type. If it were a blues song, there would be an unfired pistol on the dresser, but this is an old traditional American folk ballad, so the silver dagger is firmly gripped in the right hand of the young girl’s mother, who is sleeping next to her. The girl is being wooed by a handsome troubadour and the girl’s mother does not wish her daughter to suffer the same fate as she herself endured many years before. The girl follows her mother’s well meant advice, and in the last line of the song vows to sleep alone all of her life. Deep stuff, in sometimes muddy waters, indeed! So a bit of a relief almost when Joan fasts forward to a Bob Dylan song which was once contemporary, but now seems almost “traditional” in its own right. It’s All Over Now Baby Blue with some tasty Spanish guitar lead from Dirk Powell, as Gabe switches fron the cajon to bongos. It’s all over now Baby Blue, the sky is falling in on you. It is a song which may have been Dylan’s counterpoint to Joan’s famous song Diamonds and Rust, about their own personal relationship, or perhaps Baby Blue may even have been autobiographical from Dylan, as he controversially crossed over from acoustic to electric music around this time in the mid 1960s. The jury is still out debating that, but both are damned good songs. Me and Bobby McGee. The song that Kris Kristofferson wrote for, and about, Janis Joplin features Dirk on the mandolin as Gabe switches to snare and cymbals. The surprise being the young, lady Grace Stumberg who, up until now has been “only” looking after Joan’s special acoustic guitars, as one of her many other duties on tour, but Joan confides that “she can also sing”, and that she does very well indeed, and she sings back-up vocal for Joan intitially and later she and Joan swap verses on this great song, which was Janis Joplin’s only number one hit. Ironically Grace is about the same age as Janis Joplin was as she was originally singing this song and Grace has a similar diminutive stature which belies the incredibly powerful voice hiding inside it. 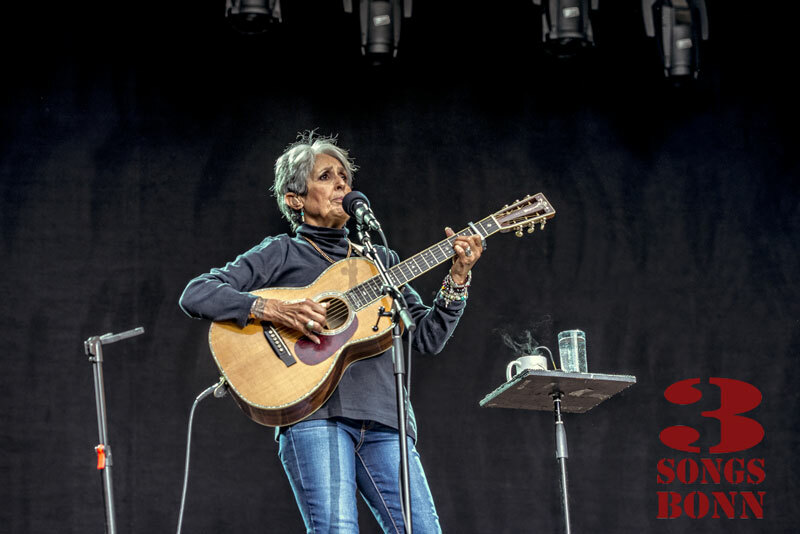 It is a credit to Joan Baez for not only recognising Grace’s talents, but being equally gracious in allowing Grace to join her on stage to sing with her. She had been equally gracious with intoducing Bob Dylan to her own stage performances from 1963 onwards, but then Mr Zimmerman himself became stupendously famous suddenly in 1965, when they were both on tour together in England, and he seemed to become Mr Forgetful. Joan was genuinely hurt by the lack of Bob’s reciprocality then, but she seems, as ever, to have turned the proverbial other cheek, and still extends the same graciousness in 2015 to Grace Stumberg, as she did back then to Dylan in the mid 1960s. God ain’t us, but God bless you Joan for continuing to believe and for simply doing what you do, for the good of all of us. Wenn Unsere Brüder Kommen/When Our Brothers Come by Konstantin Wecker is a song about pacifism. This is first time that a music stand has appreared on the stage. Joan has the words to most of the songs that she sings tatooed on the back of her eyelids, should she ever need to refer to them. This song is different though, the text is in German, a language which she doesn’t speak fluently and the crowd are deeply touched by her gesture. Konstantin Wecker and Joan Baez go back a very long way together and have many things in common. Konstantin, like Joan, always tries to help up and coming new talent. We have seen this in the Folk Club Bonn with a recent special guest Cynthia “and friends” from Bad Godesberg. Konstantin has taken Cynthia under his wing and certainly given her musical career an amazing boost, by producing her recent CD. I Need You Just The Way You Are is a wonderful song written by Dirk Powell. Joan puts down her guitar and sings this melancholy song with only Dirk accompanying her on piano, and she nails it with a passion as if it were one of her own, deftly backed up on vocals by Grace, who also takes the lead on a couple of verses. Dirk now leaves the stage, though Grace remains and Joan takes up her Martin guitar for Diamonds And Rust, a song which is Joan Baez on Bob Dylan who she met in 1963. Bob Dylan realised in the early sixties that Joan could sing and guitar pick the pants off him, but she is still better known as an interpreter of other peoples’ songs, rather than as a songwriter, however, with Diamonds and Rust even Bob got a shock, not just because of it’s intimate content, about her sharing a crummy hotel overlooking Washington Square (in Greenwich Village in New York city) with some one who was already a legend, the original vagabond, but because it is of a calibre as a song that gives even him a run for his money. How can you possibly not appreciate a song with a line like Eyes bluer than robins’ eggs in it? Day After Tomorrow is a song by Tom Waites that Joan performs solo, just accompanying herself on the guitar. Just how does God choose, whose prayers he will refuse? Intriguingly Joan works in an accomplished picking of The Last Post during the break on this one. Dirk Powell and Gabe Harris return to the stage for Seven Curses which is Bob Dylan’s 1963 arrangement of a traditional ballad, in which a certain Mr O’Reilly steals a stallion, is apprehended for the crime, and his daughter hears of her father’s plight and rides to save him with offers of gold and silver for the judge. O’Reilly warns his daughter not to give herself up to the judge, but she does, and true enough, the judge breaks his word and O’Reilly is still hung in the morning. All that remains for the distraught daughter are the seven curses placed upon the wicked judge. Joe Hill is a song about organising and taking risks about choices and it’s a song Joan sang at the famous Woodstock music festival in 1969. Dirk plays a button accordian on this one giving it a wonderful Cajun / Zydeco feel. It is a song about organised labour in the mines and mills, where you’ll find Joe Hill, I never died said he” . 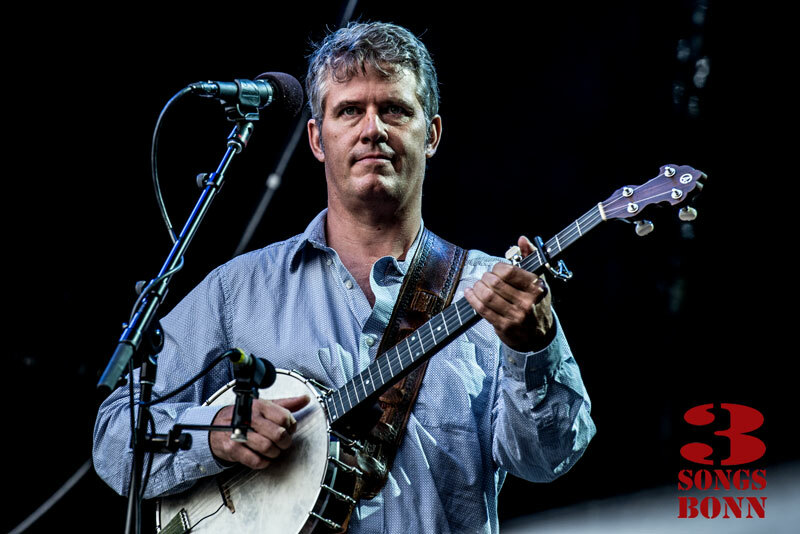 featuring DP on 5 string banjo in an old country hoe down on which Dirk shows that not only can he play every instrument in the music shop, but that he can also sing as well. Joan describes this as ” a happy folk song from Virginia in which no one dies”, and also features a percussion solo from Gabe featuring Cajon and Djembe whilst Joan’s showcases her dancing feet as she and Dirk Powell joyfully waltz together around the stage. After the dance Joan videos her son on her I-phone whilst dancing around him during his solo. Touching stuff indeed. Dirk’s banjo picking cuts back in for the final verse as 12 green parakeets swarmed screeching overhead in warm approval. House Of The Rising Sun. Geordie R&B group The Animals changed everyone’s perception of this song forever when they had a number one hit single almost all around the world with it in 1964. Joan of course had already recorded this song in 1960 and sticks true to her origional version with Dirk on electric bass on this one and Gabriel Harris on percussion, deftly using his sticks on the snare and cymbals. Joan plays this with a capo on the third fret, so in C minor. There is a deep dark disquieting feeling to this song, four green parakeets fly past as Dirk does a haunting bass solo before Joan and Gabriel join in again for the final return to that old house of the Rising Sun in New Orleans..
Don’t think twice it’s all right the Bob Dylan classic is up next. A song which everyone in the audience knows and features Dirk Powell’s lead breaks on Spanish guitar. Long Black Veil, a token country and western song made famous by Johnny Cash among others, is a tragic love song about a man who is hanged for a murder which he did not commit, but the secret alibi, that he was in the arms of his best friend’s wife, went to the grave with him. This the one country and western song of the evening and has Dirk Powell picking up the fiddle, is there no end to this man’s musical talents? Joan certainly doesn’t need a big band with Dirk at her side. Gabe plays cajon on this and Grace Stumberg is back on stage again helping Joan out on vocals, but it is the lilting fiddle by Dirk which sets the stamp on this one. Gracias a la Vida / Thanks For Life sung in Spanish is a song by Chilean musician Violeta Parra who commited suicide in 1967 and it has been in Joan’s repertoire since 1974. It is one of the most famous songs of the Nueva canción genre, a movement of folk songs as a powerful social force in South America and on the Iberian peninsula in the 1970s and 1980s. Not everyone in the audience is fluent in Spanish, although several within my earshot are, but anyway, everyone joins in with the lai-lai-lai-lai-lai in the chorus with Gabe accompanying her on cajon and emotive cymbals. This is supposedly the last song of the evening, but the whole of the KunstRasen rises in unison for a tremendous standing ovation and any hopes Joan may have had of having a very early night, drift out the non existent windows, along with the parakeets, now flying overhead again. Joan spoils the audience with Pete Seeger’s song Where Have All The Flowers Gone? a song which has been translated into virtually all the languages in the world and in German as Sag mir, wo die Blumen sind? is perhaps the world’s most famous anti-war song. This was the second song she sang in German this evening and was manna from heaven for the many 1968ers in the audience, who had taken part themselves in the pacificism and protest movement in Germany in that year. This was a German text that Joan knew off by heart and this was a song which was often sung during the German student protests in 1968 against the Vietnam war and at the most violent height of the Civil Rights movement in the USA. When will they ever learn? Wann wird man je verstehn? Truly tumultuous applause from the audience for this one. John Lennon had pretty much managed definitively to put his thoughts on love and hate into song with his masterpiece Imagine, which outlines the possibility that established religion and nation states are not necessarily the termini for the ultimate development of mankind living together in peace in the future, if only the small matters of personal greed and jealousy can be first vanquished. Everyone’s up on stage now, Dirk is on the grand piano and Gabe on cajon as Joan makes this song her own with vocal backing and harmonies from Grace. One of the astonishing things about Joan is that I cannot think of even one song which she has covered which has not been enhanced by her so doing. It’s certainly not everybody that one can say that about.Listening to Joan Baez singing Imagine it becomes clear what a great masterpiece this song of Lennon’s is. Paul Simon’s The Boxer follows, an iconic song of the 1969 made famous by the duo Simon and Garfunkel. Dirk’s playing Spanish guitar and Gabe’s on the bongos with Grace on backing vocals. and Grace takes over the lead vocals for the verse Asking only workman’s wages, I come looking for a job, but I get no offers. The crowd join in with the ‘lie-la-lies” in the chorus and are really lapping this up. Donna Donna is also a great song for audience participation. Joan does this as a solo with her Martin 0-45 as the only accompaniment, as she turns her profuse talents to this yiddish theatre song about a calf being led to slaughter. 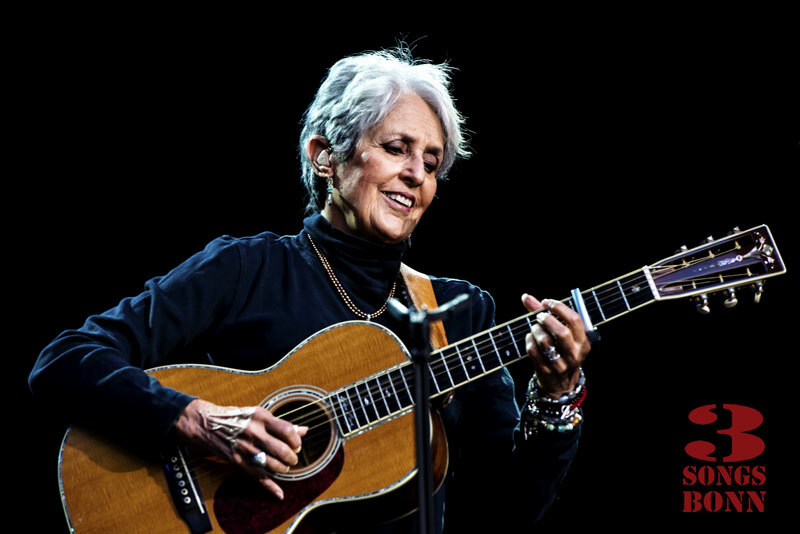 Joan Baez, a bright shining, singing beacon of the non-violent peace movement which the U.S. government found impossible to either turn down the sound of, or to douse the light and extinguish the flame. When one attends a large music concert nowadays, it could literally be almost anybody up there on stage singing to you. In the case of Joan Baez, it couldn’t possibly be anyone else. Her generous nature pervades her own stage presence and almost everything she has done in her life. There is an elegant simplicity and a deep charm in everything that she does. She doesn’t bother to dye her grey hair, but chooses to wear it like a badge of honour. Perhaps if God really is on our side he’ll stop the next war! Certainly, if the deity above, should ever need any help in this tumultuous task, he (or she) can count foursquare on Joan Baez – a consummate, most considerate human being, a damned good non-violent fighter and war doubter, and also war-douser, not to mention a wonderful and brilliant folk singing troubadour. Her voice alone raises goose pimples, even before one begins to understand the meaning of the words. She appeared on the cover of TIME magazine when she was only 18 and labelled as the “Queen of Folk”, perhaps that should be now appraised and upgraded to the “Empress of Folk”?. She is certainly a great inspiration to many women, especially those actually younger than she is, yet considering themselves to be in “old age”. Joan makes such women think twice. Joan’s mother known as “Big Joan” often accompanied her daughter on her political protests and she, of good Scottish quaker stock, lived to be over 100 years old, so the chances are we are still in store for a lot more “mischief” from Joan Baez for a long time to come. In politics in the USA, unlike in the UK and in Germany, we’ve never experienced a woman breaking through the glass ceiling and being not just “your man’s First Lady” but being the very first veritable “First Lady”, as a woman in the White House in her own right. 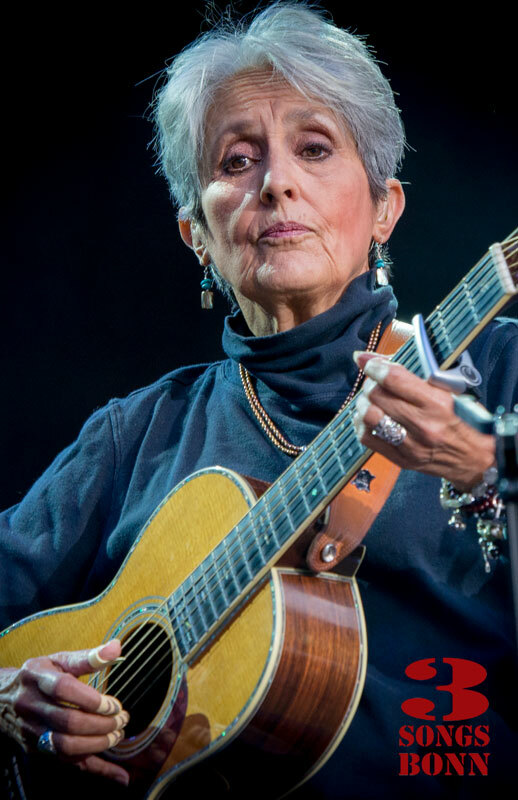 Well, if Hilary Rodam Clinton actually makes it, then when she finishes her first term in office as “Mrs / Misses President”, she would be about as old as Joan Baez is now. I could certainly live with that, and I am sure that Joan Baez could find a role in the new world of the new USA with a foreign policy of conscience, consideration, tolerance and peace. Wouldn’t she make an excellent U.S. Secretary of State (the most senior political appointee responsible for foreign policy, equivalent to a Foreign Minister)? 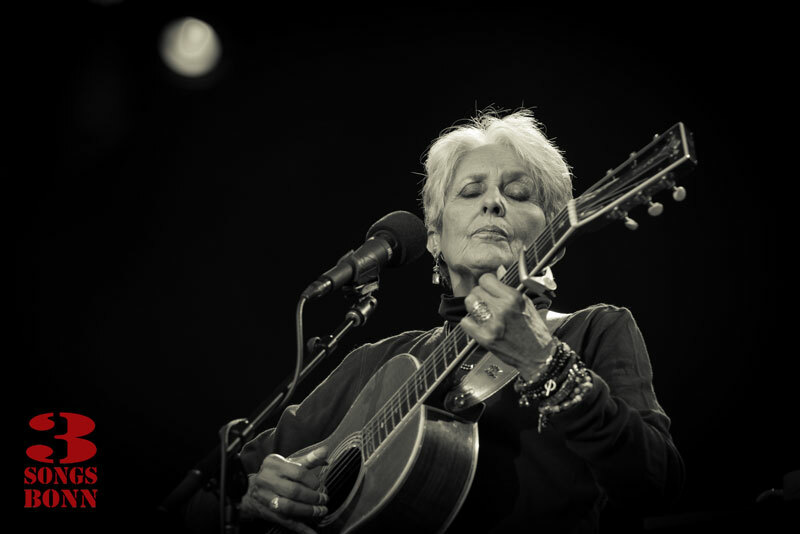 Thank you Joan Baez, for such a wonderful concert, and for “getting it” such a long time before the rest of us. 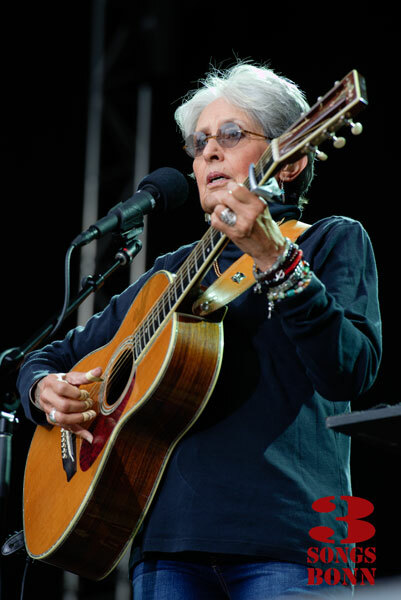 This entry was posted in Gig Reviews and tagged Bonn, Joan Baez, Kunst!Rasen. Bookmark the permalink.